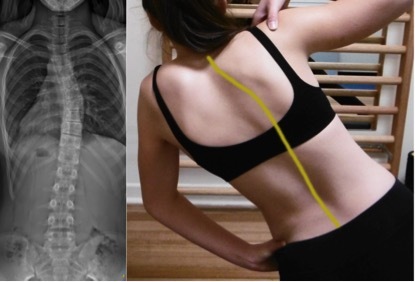 The Schroth Method is a specific scoliosis exercise program used as a conservative treatment of scoliosis. The Schroth Method exercises are quite different from normal exercises. The patient places themselves in a position that aims to correct the curvature giving them technically a straight spine, while performing the exercises. It some cases, patients if flexible enough, can reverse their curvature into what is referred as an over-corrected spinal posture. Once in this position the patient uses a technique called rotational breathing which further corrects the curvature. The overall aim is to correct the patient’s posture in all three planes of spinal motion, sagittal, coronal and axial specific to their curve pattern. When the patient places themselves in a specific position according to their curve, the Schroth exercise technique aims for stabilisation of the spine through activation and strengthening of the muscles surrounding the spine, improving spinal mobility and improving posture. While performing the exercises, the aim is to lengthen the muscles on the concave side, while shortening muscles on the convex side, while further de-rotating the rib cage and trunk. The Schroth Method can be a very effective form of treatment when performed well. It is important that the Schroth Best Practice program is delivered by a certified practitioner, the Schroth exercises are complex and specifically tailored to each individual’s curve pattern. Once mastered it is an empowering tool patients can use to manage their scoliosis in the long-term. These treatment goals are dependent on the type of curve, curve progression and skeletal maturity. An individual assessment is required to determine potential treatment goals, outcomes and referral if required. EXAMPLE – The yellow line represents the patient’s curve position as per the x-ray. The over-corrected spinal position can be seen in a patient performing a Schroth exercise with a short thoracic curve.